The best miso ramen bowl is one that doesn’t get too complicated. I hate when ramen bowls are packed with 100 ingredients and toppings and when the bowl is overflowing with noodles. That’s just not the way to serve a good bowl of ramen! The simplicity of ramen is where it shines. It’s when the broth smacks your lips and coats your tongue perfectly. It’s when the bite of the noodles is perfectly al dente. There’s also a balance of toppings that will leave you satisfied but always wanting more. This is how you know a good ramen bowl when you see it. 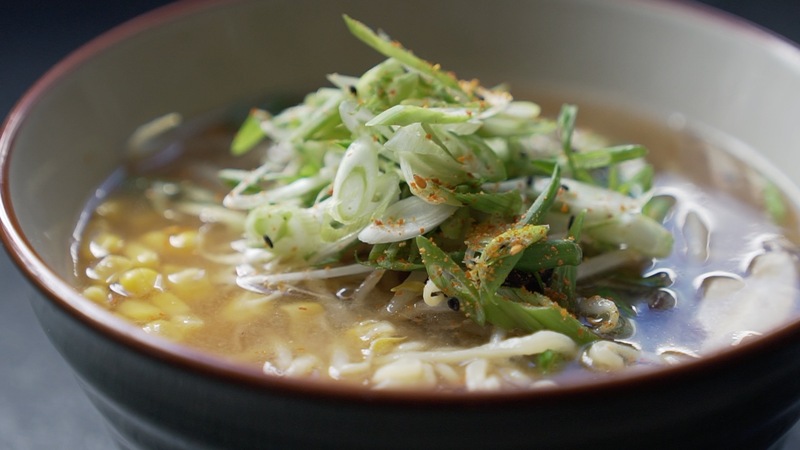 In this cooking video, I’m doing a Vegan Miso Ramen that’s packed with umami. I use a ton of dried shiitake mushrooms and some local Bay Area kombu. For toppings, I went to my favorite grocery store – Rainbow Grocery, to grab my fresh shiitakes, wood ear mushrooms, and Nona Lim ramen noodles. The best part about this recipe, is that it’s simple to do anytime and doesn’t require a ton of man hours to make the broth substantially flavorful! Lastly, I shot this video in tribute to Peaceful Cuisine. For the past couple of years, I’ve watched his videos and just always admired how amazing they were. While there’s no way I could do it better than him, I wanted to capture his style of shooting and editing as a tribute to how much I’ve learned from watching his cooking videos. I’ve seriously learned so much and if you’ve yet to check out his YouTube channel, go there right now and subscribe! It’s truly a work of art. Hope you can enjoy this video and recipe as much as I do! Thanks so much for watching! Prepare all vegetables. Cut leeks into thumb size pieces. Peel onion skin and cut in half. Slice shiitake mushrooms and thinly slice wood ear mushrooms. Cut carrot, green onion, and add all vegetables to pot over medium heat to sear. Once vegetables are charred, add 8 cups of water to pot and bring to boil. Add in dried shiitake, kombu, coconut oil, and miso paste. Let simmer for 20 minutes. Strain all veggies from broth. Add in fresh shiitake mushrooms, wood ear mushrooms, and bean sprouts. Turn off heat after 1 minute of boiling. Boil ramen noodles for 3-4 minutes and strain. Place noodles into bowl, along with corn toppings. Add broth with bean sprouts and mushrooms, and top with green onion. Serve with a sprinkle of shichimi togarashi pepper. Enjoy!